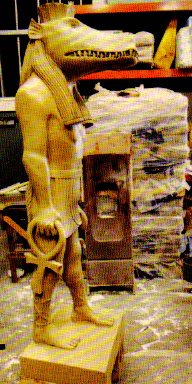 In the most recent issue of Lost: The Official Magazine (issue "It's Time for the Beginning of the End"), we got an even better glimpse of the statue of Taweret, which we've only seen from an odd angle. Well, okay, it's just the side view of the model used for CGI reference, but I think it should be pretty accurate as far as canonicity goes. What do you think? Do you think that it's accurate in its depiction of Taweret? Let us know your thoughts about that statue in the comments section below. NOTE: The quality of the image on the right is a result of its being scanned. For a more high quality version of the image, pick up a copy of the latest issue of Lost: The Official Magazine, in stores now.